2010 Was another year of Serious Human Rights Violation and State Terrorism By Indian Army Against People of Occupied Kashmir which are facing this Situation from many decades. In year 2010 alone Indian Army burnt 41 Kashmiris alive while more than 2100 Buildings where also burnt due to which thousands of Kashmiris lost their Businesses in different parts of Occupied Kashmir. 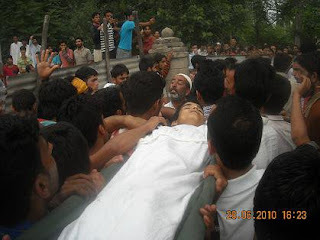 According to report of Kashmir Emergency Service 41 Kashmiris where burnt alive while 29 where seriously injured by fire. 103 small Shops where burnt by Indian army while hundreds of big buildings where also burnt. most of these Incident taken place in Sri Nagar, Baramulla and Pulwama.